My vegan life in Thailand..
LOVING HUT Tokyo moved to another location. My favorite vegan restaurant the Loving Hut recently moved. OUT NOW : My new vegan pizza recipe fundraiser book ! 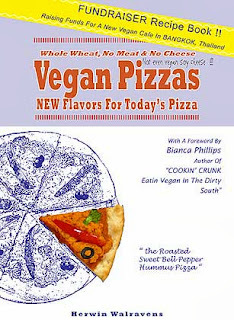 I finally finished my new book Vegan Pizzas NEW Flavors For Todays Pizza. It is a modest 61 page book with pizza recipes and general guidelines how to make a tasty vegan pizza. Making a tasty vegan pizza is basically different from making a regular non veg pizza. This book is from 4 years experience baking vegan pizzas in a vegan restaurant in Bangkok, Thailand. It is a fundraiser cooking book ; with the sales of this recipe book i aim to get enough funds to start a new vegan cafe in Thailand. This first edition is in PDF, EPUB, and Kindle. If i get enough positive responses i will make an extended second edition in full color paperback. Support the book and a new vegan cafe and buy the pizza book ! The ebook costs 6.99 us$, please paypal to herwin1234@hotmail.com and i will send to you in a few days. Second Edition 2009, Full Color 158 Pages Bilengual JAPAN Vegan Restaurant Pocketguide. Herwin's Vegan Cafe in Bangkok has moved to the Sukhumvit area in Bangkok and with a new name ; Herwins Vegan KITCHEN. Be sure to visit us and enjoy the vegan food while visiting in Thailand. Omote Sando's new VEGECATE ! Are you in poshy poshy Omote Sando or nearby Shibuya doing some serious shopping ? Feeling Hungry ? Get your vegan yummies in the newly opened vegan restaurant VEGECATE runned by two super cool vegans Mayuko and Yuya ! Cool Picture Some Guy Drew Of Japan ! Defenitely check out JAPAN365, a guy drawing a picture a day of things Japan, with a ballpen and making a book of it. # 361 "Man's land" is my favorite and pays hommage of the brave animal rights activists who entered radiation zone to rescue abandoned animals. Leaving animals behind, that were once in our care, to die a slow hunger death ? We are still a very long way of becoming a true civilization.. Pledge to Invest And Earn 50% !! e-Fund-Raiser For New Vegan Restaurant On SILOM Road, BANGKOK. this year will be the third anniversary of the Herwin's Vegan Café in Bangkok, Thailands. After three years of developing our cooking style, and learning to run a small restaurant, we are ready to open a restaurant on SILOM road, one of Bangkok's busiest areas. For starting a new restaurant on a main road we need a minimum of 10.000 us$ to start and we hope to raise that money with this fund raiser and YOUR participation. Join us in starting a new successful restaurant on SILOM road, help spreading the healthy and yummy vegan lifestyle on a main road in this buzzing Asian city, and earn 50% interest on your investment ! Why invest in our new vegan café ? We have more than two years experience. 50% profit in three years. Step 1. Make you pledge TODAY ! Let us know by e-mail how much you can invest. Suggested investments are 500 us$, 1000 us$, or 3000 us$. Remember, this is just an informal and legally non binding pledge ! Step 2. When we have collected enough e-pledges, we contact you how to make the investment. Now your pledge turns to the real investment. Step 3. Now we start finding a suitable location with an affordable rent on SILOM road and pay for the deposit and other starting costs ! Important : Finding a good location with reasonable rent is a crucial point in our plan. IF we cannot find such a location to start a new restaurant within a reasonable time, we will transfer your money back. This means your full money back but no 50% interest. step 4. Hooray hooray we open our new restaurant ! Step 5. After one year of the opening we start paying back in yearly payments. If you invested 1000 us$, three years after the opening, you will have collected 1500 us$. I Want To Invest But How Risky Is It ? We have two years experience of running a restaurant, and we live in the Silom area. We know Silom road, the people who walk and work there, we know that our target customers come from Silom road. Our decision to open on Silom road is not a shot in the dark but a well thought over decision based on two years living next Silom road and knowing it well. If we don't find a suitable location, we return the money. So until the point of actually finding the new restaurant and signing the contract, your money still is safe ! Again, don't listen only to us but listen to our customers. Read the reviews on Happy Cow, basically our customers say that they like the food very much and our vegan café but they also say that our current location is very hard to find. Imagine, when our new restaurant is on a location that is not tucked away but easy to find and in a tourist street ! Extra customers, extra profit ! Please only invest that amount of money that you can afford to miss. Invest In Veganism And Earn 50% ! Send Us Your E-Pledge Today And/Or Help Us Spreading This E-Fund-Raiser !!! Silom road is a 4 mile long busy road in the financial district of Bangkok. The road starts at Lumpini Park, and soon arrives at the famous Patphong area, a tourist area with a night market and and a red light district. Many high office buildings line the Silom road. Halfway Silom road, now we enter the gem and jewellery district of Bangkok. Besides offices, there are a lot of gem and jewellery shops and the 150 meter tall Jewellery Trade Center, and many tourist hotels like the Holiday Inn, the Sofitel Hotel, the giant State Tower Hotel, the Narai Hotel, and just last year the Novotel opened the doors showing that this part of Silom is still in progress. Also close by is Bangkok's famous Shangrila Hotel. Surprisingly there are little restaurants, especially at night there are only a limited options to eat. It is here between the hotels that we want to open our new restaurant. Our Menu, Our Cooking, Our Customers. We are a vegan restaurant but our customers aren't certainly not only vegetarians ! We offer a menu that appeals to many people, vegetarians as well as regular non vegetarian people, like a Middle East menu with hummus, falafel, baba ganoush and pita bread. We also have a Thai menu, French fries, curries, an Italian menu and quality cakes. It is a menu developed in three years, tested and proven popular with our customers. We specialise in regular yummy easy foods (not fancy gourmet foods) that appeal to many people and we prepare them with fresh and quality ingredients. Currently around 20% of our customers are regular non vegetarian people. Our present location is a local street with few foreigners passing by. Our new location is on a main tourist road so we safely can expect that the percentage of non vegetarian customers will rise. JOIN US AND MAKE YOUR PLEDGE TODAY ! Help Us Make It Happen In Thailand ! People ordering several guidebooks and NOT paying for them. WTF. Dont these people realise that they are simply stealing money from me ? I am not a big company, i am just a person who selfpublishes a guidebook, and every guidebook NOT paid is a financial blow to me. "Thanks", Kazuo Inue, for NOT paying two guidebooks and for NOT responding to emails. As most readers of the Vegan Japan blog probably know, I am since two years running a small vegan cafe in Thailand's capital Bangkok, called Herwin's Vegan Cafe. It's an international minded restaurant with an internmational kitchen and both local Thai customers, Indian customers, and the veggie gaijin, or, as foreigners are called here ; farang. Our most popular foods are our home made pizza's and eggless cakes . With two years experience of running a cafe, cooking and baking, creating a nice atmosphere for our customers, a knowledge of how this city works, it's time to expand or open a new shop to work out some new exciting ideas that we have developed. To realise a new shop we need financial help in the form of somebody making a modest investment in our new shop. Just think about this, with a modest amount of money that wouldnt even be enough in other countries to furnish a new cafe, we will be able to open a whole new shop in a mainstreet of Bangkok. Do you have some money to spare and you want to be an essential part of this Bangkok vegan experience, please contact herwin1234@hotmail.com for more details. What do our customers think of Herwin's Vegan Cafe ?Read reviews on Happy Cow. 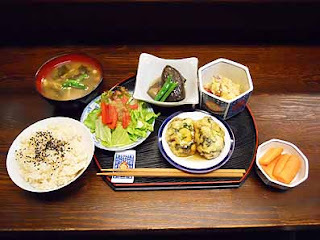 Free Copie of JAPAN Vegan Restaurant Pocketguide For Visitors Of Granma's Vegan Cafe !! All vegetarians and vegans in Okinawa probably know Cafe Granma, an informal vegan cafe open only by appointment and only in the weekends. This month, the owner cook who is passionate about vegan cooking, finally opened her public vegan cafe, called Granma's Vegan Cafe. It is a buffet style vegan restaurant, close by the beach and with a guestroom. The opening times for the months october and november are 15.00-20.00 open tuesday~sunday, and after that check this website or the website from Grandma's Vegan Cafe (website has MAP + address). When i visited Okinawa during preparations for the JAPAN Vegan Restaurant Pocketguide i visisted and did eat several times in the Cafe Granma. The food was just great and tasty, because the cook owner is just passionate about cooking and creative, always trying to make a new dish or improve previous dishes. So its great to see that after so many years of my first visit, this vegan cafe goes public !!! I only can imagine that the food must be even more delicious than the times i did eat there three years ago. Visiting or living in "Oki" ? Give yourself and your friends a vegan treat and visit Granmas Vegan Cafe !! The first 20 people who visit and eat in the new Granma's Vegan Cafe get a FREE COPIE of the JAPAN Vegan Restaurant Pocketguide ! In order to get a free copie, all you have to do is to say to the staff (before you make your order) the secret word ; "Vegan Japan". "The area abounds with outdoor activites; hiking, horseriding, swimming, fishing and more…"
hold it there buddy, so first i eat in your vegetarian cafe and then i go for a stroll and do some sports fishing ? Hmmm. closed, closed, CLOSED, c-l-o-s-e-d ! - Cafe 8. For all you vegs in the neighborhood, don't ya weep, just at the other side of the street is the veg restaurant Alaska, which is a very cool and hip place with exciting food. - Der Akkord. 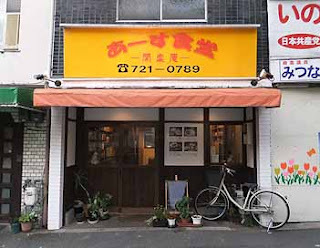 This legendary Bakery in Tokyo's posh Omote Sando area closed due to the tragic death of the owner, r.i.p. - Miki Tenkai. Who hasn't picked up a take out veg lunchbox at Daykan Yama station in Tokyo from mr Miki Tenkai ? Well, rumors has, this buddhist monk killed somebody (very un-cool) and is now serving time in jail ! -Vege Canteen. Such A Shame ! We Miss You ! -Salon Cuttho in Okinawa also reportedly closed it's vegan doors. As anyone can imagine, just a mere four months after the devastating and massive disaster that whiped away whole towns, crippled local infrastructure, and even caused a nuclear disaster, many people in the affected areas, including children, still live in shelters and sometimes struggle to get by and are dependent on gifts from grassroots groups who visit and donate necesary goods and food. Martin Frid, long time resident of Japan, ex-employee of Saitama's Alishan Cafe, blogger, eco activist, author of the Safety Ranking Book (the original title is in Japanese Nippon Shoku no Anzen Ranking) is such a grassroot activist who visited the north with 10 people and 4 vans loaded with goods for the smaller shelters. 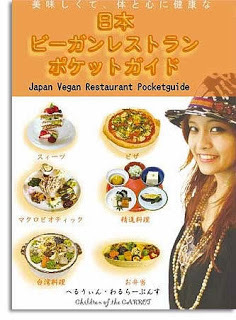 As for me, the sales of one box of Japan Vegan Restaurant Pocketguide will be donated to mr Frid and his group. For obvious reasons traveling to Japan has declined and so the need for buying a pocketguide. Still, we have sold 8 pocketguides and donated all the money to the Red Cross. To pump up our efforts we also have asked bookshop Kinokuniya to donate all sales from our pocketguide directly to the Red Cross Victim Relief Fund. Not sure how much pocketguides it is, but it is expected to be between 15, 20 pocketguides. For now we stop our campaign. Veggie Confusion! 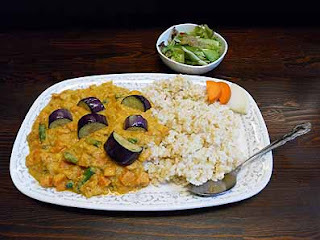 Seems like there is a NEW veggie restaurant in Tokyo with the same name as my all time favorite restaurant GOVINDA'S in the Nakano area, close by the famous Deva Deva. Aparently this new Govinda's restaurant recently made a 5 hour trip to the Miyagi prefecture with 3 SUV's, loaded with veggie meals, and 800 kg of fruits and vegetables, and visited 5 refugee shelters. in order to show support for the victims of the earthquake and the tsunami of Japan, i decided to donate the sales of the pocketguides sold online to the Emergency Relief of the Red Cross. BUY A POCKETGUIDE AND 18.80 US$ WILL BE DONATED FOR JAPAN. I hope that more people will donate, especially people that have visited Japan and have good memories of Japan and it's friendly people. I hope that everybody realises donations, and much of it, are esssential for a fast recovery. Donating can be easy, you even can donate with Paypal which has a special easy-as-onigiri Japan Earthquake and Tsunami Relief webpage. or support a vegan food relief who are currently sending meals, fruit and vegetables to the affected area's. Tokyo sure has become an exciting hot spot for veggies the last years. New places just keep popping up, i mean, very good and profesional veggie places and the diversity is just awsome, like the new exciting raw food Rainbow Raw Food to the humble and small vegan noodle shop Asahi and recently a new Veggie Taiwan restaurant opened. To quote a veggie resident who did eat there and informed me about this place : "The food was great! Also large menu, large portions, large restaurant, and low prices. I couldn't believe my luck!" Got a free day ? 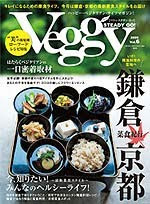 Go veggie restaurant hopping, it might take you to never-visited areas of Tokyo while discovering a new veggie place, new veggie foods, and supporting the growing veggie scene in Tokyo. With all these new awsome classy hot new Veggie Restaurants its a mystery why a group like the Tokyo Vegan Meetup still have most of their meetups in the non-veggie restaurant Pink Cow. All you real veggies and food lovers go ASAP to the new Taiwan restaurant, it's hot, hot, hot, (and cheap prices) and i heard rumors it will be in an upcoming issue of Veggie Steady Go! "Why Must We Eat The Animals ?" listen to this vegan song that rocks your socks ! My name is Herwin, i am the writer of Vegan Restaurant Pocketguides ; the JAPAN Vegan Restaurant Pocketguide and the BANGKOK Vegan Restaurant Pocketguide. I am vegan, animal rights activist, Vegan Entrepeneur, and traveler who is discovering the veggie roots in Asia. I have visited Hong Kong, Taiwan, Thailand, Laos and Japan. The last four years i did run the Herwin's Vegan Cafe in BANGKOK, Thailand.